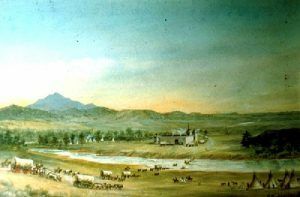 Fort Laramie Skirmish (June 15, 1853) – During a gathering of Lakota Sioux and Cheyenne near Fort Laramie, Wyoming, who were waiting to receive their annual treaty goods, an argument occurred in which a Sioux warrior fired a shot at a soldier who was operating a ferry on the Platte River. Lieutenant Richard B. Garnett, who was in command at Fort Laramie responded by sending 23 men under Lieutenant to arrest the shooter. Horse Creek Skirmish (November 13, 1854) – After Brule Sioux Chief Brave Bear died from a wound received in the Grattan Fight, a number of young warriors wanted to retaliate. Brave Bear’s oldest surviving brother, Red Leaf; his half-brother, Long Chin; Spotted Tail, and two younger braves headed for the Overland Trail with vengeance on their minds. About 12 miles west of Horse Creek, near present-day Torrington, Wyoming, they waylaid a mail stage headed for Salt Lake City, Utah, killed three men, and robbed the coach of a metal box containing $20,000 in gold. The gold was never recovered. 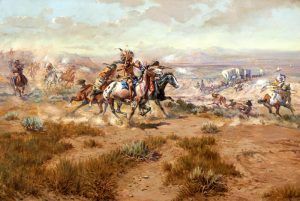 Pass Creek Skirmish (February 20, 1863) – Ute Indians attacked a stage station, near the junction of Pass Creek and the North Platte River, driving off the stock and destroying equipment. In response, Lieutenant Henry Brandley, along with 20 soldiers rode out from Fort H.W. Halleck to find the raiders. Picking up their trail, the troops overtook the warriors, killing several of them. However, Lieutenant Brandly was wounded by a ball through the left arm. The skirmish site is near Walcott, Wyoming. Sage Creek Station (June 8, 1865) – Just a few days after Lieutenant James A. Brown detached five men of the Ohio Cavalry to guard the Sage Creek Station on the Overland Road west of Fort Halleck, Wyoming, they were attacked by about 100 Lakota Sioux and Cheyenne warriors. After just about one hour of fighting, the troops found their ammunition low and were forced to evacuate with two civilians. Desperately outnumbered, the men faced an eight-mile run west to reach Pine Grove Station, with the Indians in pursuit. During the running battle, two soldiers and one of the civilians were killed, two soldiers were wounded, and another, who was wounded was captured. Only two of the soldiers made it to Pine Grove Station. The wounded and captured soldier and the second civilian were never found. The battle took place near Saratoga, Wyoming. Cazeau Wagon Train (July 17, 1866) – In July 1866, traders, Peter Cazeau and Henry Arrison, from Fort Collins, Colorado, were traveling along the Bozeman Trail in two wagons. Along with them were three employees as well as Cazeau’s Oglala Sioux wife Mary, and their four children. On July 16th, the two wagons were camped on Peno Creek about six miles north of Fort Phil Kearny when they were approached by a group of Northern Cheyenne. The Indians, who had just been in council with officers at the fort, were peaceful and joined the camp. However, later, a band of Sioux appeared, demanding that the Cheyenne join them in an attack against the soldiers at the fort. The Cheyenne refused and the Sioux responded by calling them cowards, whipping them and driving them from the camp. The Sioux also departed; but, the next morning as the wagons were preparing to move on, the Sioux returned and attacked them, killing Cazeau, Arrison, and the three mail employees. Mary Cazeau and the children escaped into the brush and were later found by soldiers who took them to the fort. Upon Mary’s arrival, she gave the warning that the Sioux were planning more attacks including the upon the fort. The site is located near Banner, Wyoming. Peno Creek (December 6, 1866) – During this bloody year along the Bozeman Trail, the warring tribes often made attacks on soldiers who were away from Fort Phil Kearny on wood-cutting details. After one such assault, which occurred about four miles from Fort Phil Kearny, post commander Colonel Henry B. Carrington led 25 soldiers under Lieutenant George W. Grummond north of Lodge Trail Ridge and sent Captain William J. Fetterman and Lieutenant Horatio S. Bingham with another group northwest toward the wood wagons. The plan was for Fetterman to drive the Indians from the west side of Lodge Trail Ridge towards Carrington and his men, who would attack them. However, something with wrong with the plan. When Lieutenant Bingham and some of the troops were riding ahead of the rest of their group, they spied a few Indians along Peno Creek and rode after them, only to be ambushed by a larger group of warriors. Captain Fetterman arrived just as many of the soldiers were fleeing. Carrington and Fetterman pulled back to the fort. In the battle, Lieutenant Bingham, two sergeants, and four privates were wounded. An estimated ten Indians were killed. In the winter of 1876, five men from Lander were hunting and trapping on the Big Wind River and were attacked by Indians. Their bodies were not found until the following spring. Two of them — Thomas Cook and a man named Spencer, were killed near the mouth of Bridger Creek and their camp plundered. Three more men — James Lisight, B. C. Anderson and a man named Davis were killed on Lisight Creek about two miles from Bridger Creek and one of its tributaries. Their camp was also plundered. On January 13, 1877, a party of 14 hostile Indians ambushed a five-man detachment of the U.S. 3rd Cavalry in the vicinity of Elkhorn Creek, in Wyoming. From January 20-22, 1877 the 3rd U.S. Cavalry clashed with hostile Indians in and around Bluff Station, Wyoming. Sergeant William B. Lewis was awarded the Congressional Medal of Honor for his bravery in the skirmish. In the spring of 1877, a party of miners from Fort McKinney was attacked on the Dry Fork of the Bad Water River and two of them were killed. Barney Hill, of the party, was shot through five times and left for dead, but came to and by crawling most of the way, reached the Sweetwater River where he was found several days later by prospectors and was brought to J. M. Bied’s place on Willow Creek and from there, taken to the Post hospital where he fully recovered. He afterward committed suicide in Montana.